This is a real rose preserved with clear lacquer so that the original color shows through. Then the rose is trimmed in genuine Platinum precious metal for durability. And now you can add a short message to a petal of this Personalized Platinum Trimmed Rose. Roses comes in a variety of colors and is even more stunning in real life than pictured. Gift comes in an elegant gift box and is approximately 11 inches high. The process takes 90 days and includes over 50 steps of hand work by well-trained artisans and skilled technicians. Each rose is unique because it is created from a real rose so that it will become a treasured keepsake for a lifetime. First petal personalization is included in the price of the rose. Color roses only. Pure gold, silver and platinum roses excluded. Add a synthetic birthstone to a rose petal for only $8.95. Add a 2nd birthstone to a rose petal for His and Hers for only $6.00. Select a color for your heart charm purchased above. If you did not want to add a heart a charm, leave as is. 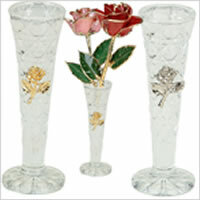 Add a matching Crystal Bud Vase with Rose Emblem. Measures 6 x 1.5 inches and holds one 11 inch rose or three 8 inch roses. It holds one 8 or 11 inch rose elegantly. Add optional personalized text below. initials, anniversary year, date or custom message. 4 Inches - Holds two 8 or 11 inch roses. Optional Engraved Message Plate Available Below. 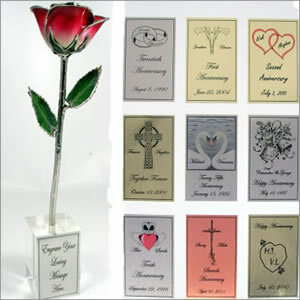 Add Optional 2 x 3 inch Engraved Plate to Heart Vase if Selected above. Examples text: Name, Initials, Date or Custom Message. Leave Blank if you do not want to add. These real roses are chosen at the peak of their bloom and then covered in 24k gold to preserve the natural beauty that would normally fade within days. Each 24k gold rose is unique and created through a 40 step process which preserves the beauty of these 24k gold roses yet makes them strong enough to hold and last forever. To preserve the color of the natural rose and to enhance the stunning beauty of the real rose beneath we now offer roses in a variety of colors with gold or platinum trim. The rose flower bloom is dipped in lacquer to preserve the rose and the color. Then the leaves and stem are dipped in gold or platinum. The flower bloom is highlighted in gold or platinum to give them a remarkably rich look. The process captures the dramatic color and beauty of the real rose beneath creating a timeless gift for you or someone special in your life. Learn more in our Personalized Rose Video.